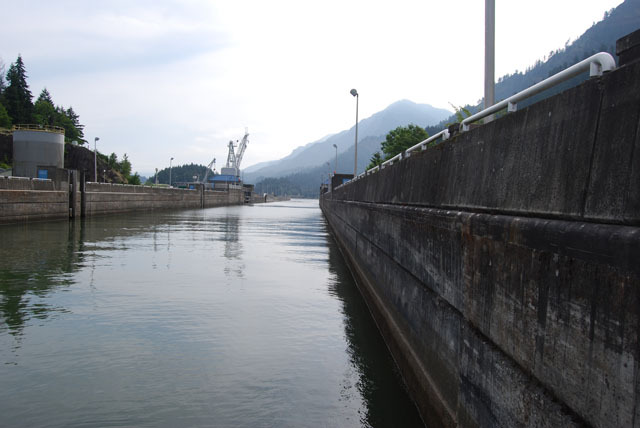 When I last wrote, we were anchored in Government Cove, just upriver from Cascade Locks. We spent a calm night on the anchor – no wind, not much current. It really is quite a beautiful spot. We pulled up the anchor and found it to be covered with a lot of mud and a certain amount of fishing tackle. 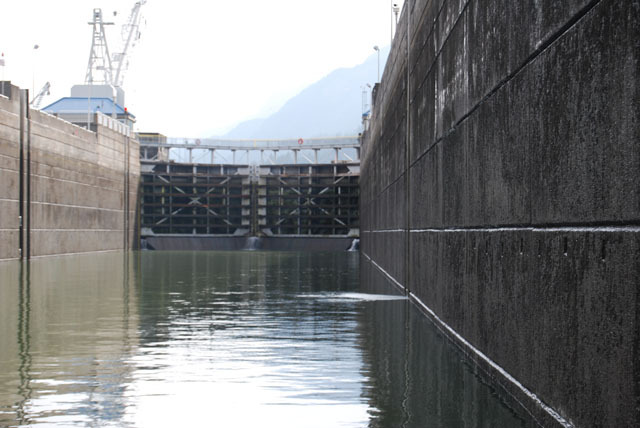 We got underway in time to make the designated locking time for recreational boats at Bonneville Dam. As we passed under the Bridge of the Gods, I again noticed all the Indian fishing platforms. No one was fishing, but presumably when the salmon are running, there’s a lot of activity in this area. It would be fun to come back in September and see the fishing. 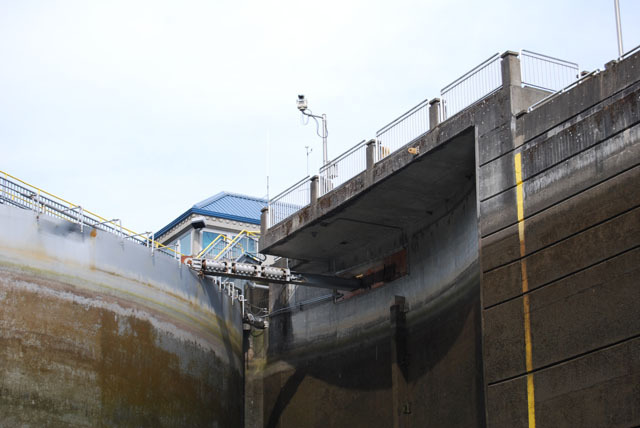 The lockmaster, “Joe”, was most friendly, and we had absolutely no difficulties entering, tying up, or exiting the locks. 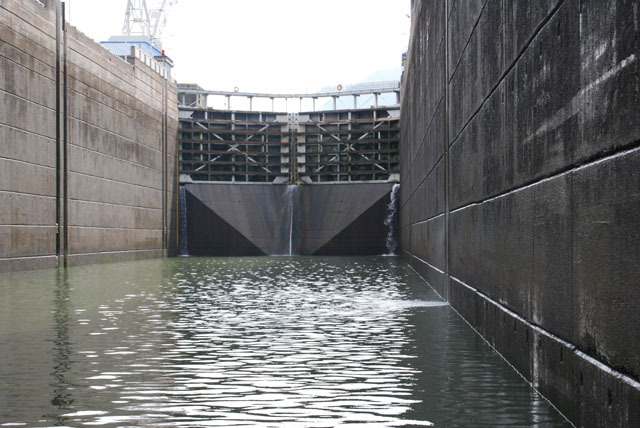 It still seems like a most amazing construction, and I noticed details this time that I had missed the first time through the locks. 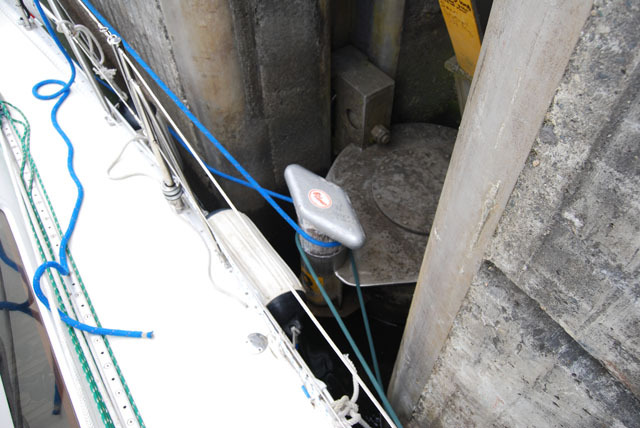 The floating bollards we tied to are in a groove that allows them to slide up and down a track, on an elaborate wheel arrangement. 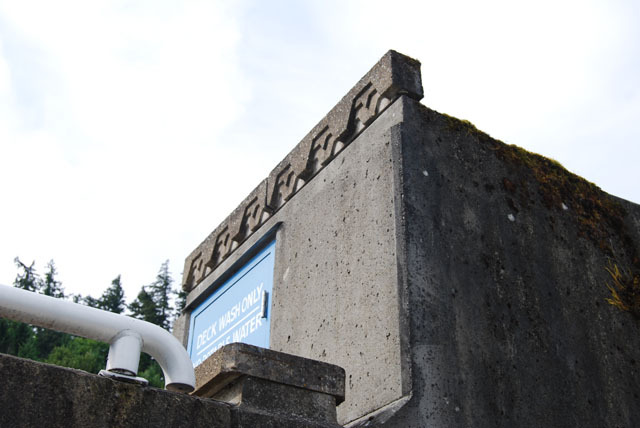 At the top of the groove, there is a lovely art-deco frieze to remind of us of the era this all came from. 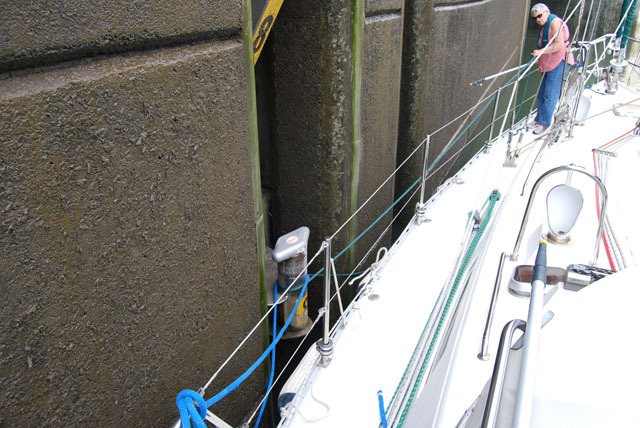 A big painted area above the bollard is ideally situated for boaters to inscribe as they lock through – it’s almost as though it was designed for that purpose. 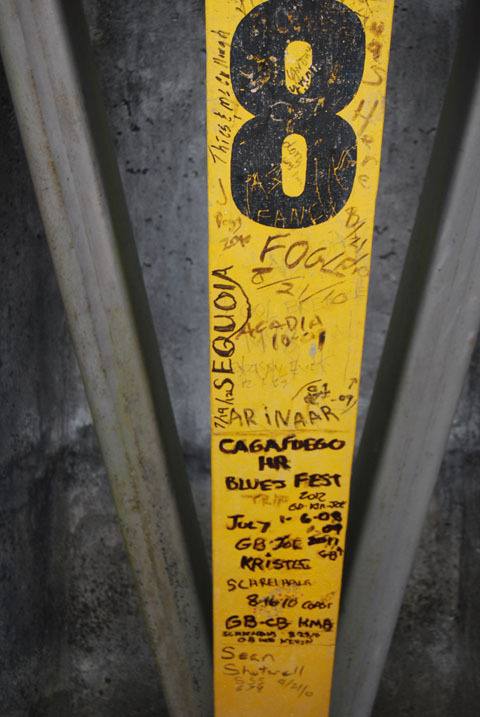 We saw no crawfish, despite earlier boaters’ descriptions of harvesting their dinner on the way down or the way up. 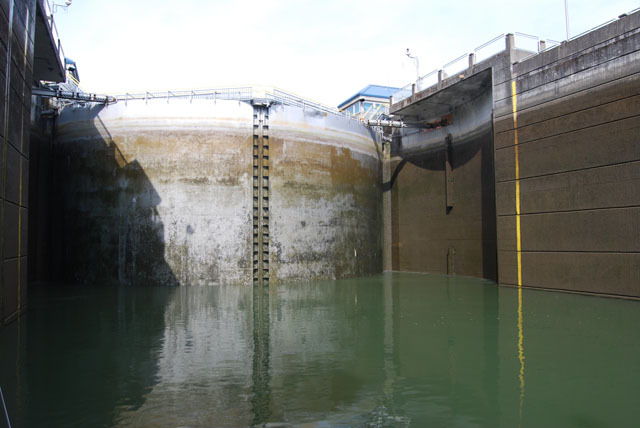 When we exited the lock, we were soon in the area of the river that has 7-8 knots of current. When we came up the river, we were sometimes making under a knot over the ground. Now, by contrast, we were making in excess of 14 knots! It was a wild ride, and over all too soon. To the left, I've put a screen shot showing our speed through the water at 6.8 knots, and speed over ground of 14.4 knots. For most of the rest of the trip downriver, the current was running 2-3 knots, with an occasional spurt into the region of 4 knots. We quickly passed through the waterfall area, Crown Point, Camas, and finally our destination for the night, Government Island. 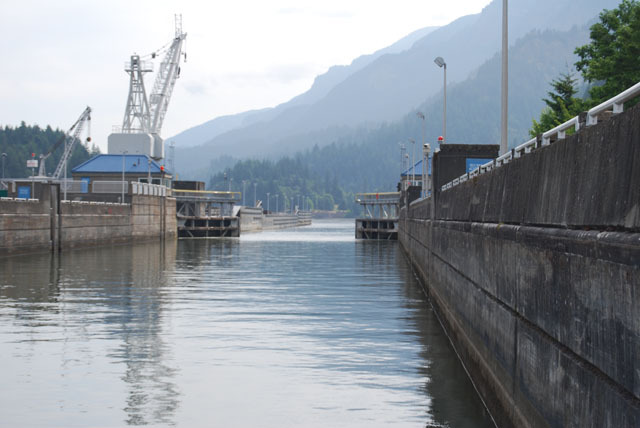 (From Government Cove to Government Island – obviously the government has had a lot of hand in shaping and managing the Columbia River, dating from the early days of settlement and naming things.) 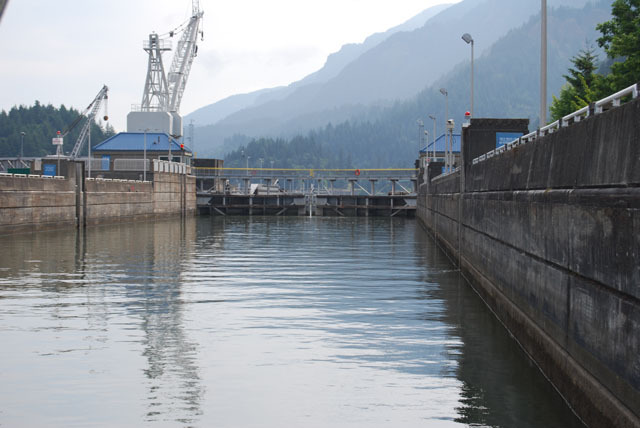 We stayed this time at the East docks – we had stayed at the West docks on the way up. The East docks aren’t quite as big, and there are a few more places ashore to walk. Same mosquitos. 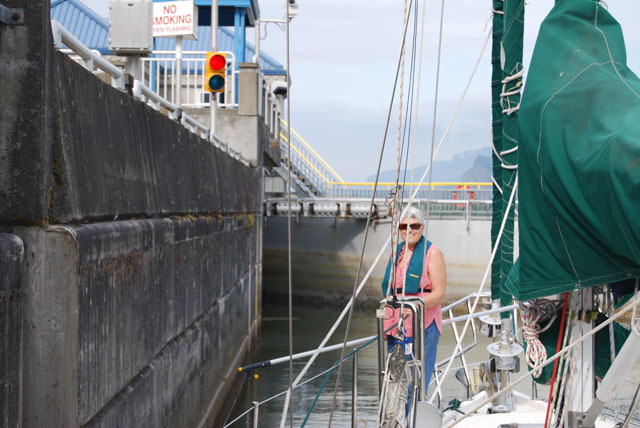 The current was still running past the docks at about 2 knots, and we seemed to be unable to get the boat to touch the dock, no matter how we adjusted the mooring lines and the rudder. So it was a big step from the boat onto the dock. To the right, I've included a photo showing the view east from the Government Island East docks -- you can see Mount Hood in the distance. Craig put out a fishing line, but didn’t catch anything. The fellow on another boat (the only other boat there for most of our stay) said he had been there for several days. He did catch a wild eight pound steelhead, but had to throw it back, as you’re only allowed to keep hatchery fish. As it turns out, of course we didn’t get hit by lighting, and the storm moved off to the north. There was plenty of rain during the night, though, so we knew our vegetable garden at home (and the weeds) were staying well-hydrated. The next morning, we headed for home, getting a bridge lift from the I-5 interstate bridge, and a bridge swing from the Burlington Northern bridge. In what seemed like no time at all, we reached Warrior Rock at the north end of Sauvie Island, and St. Helens was in sight. 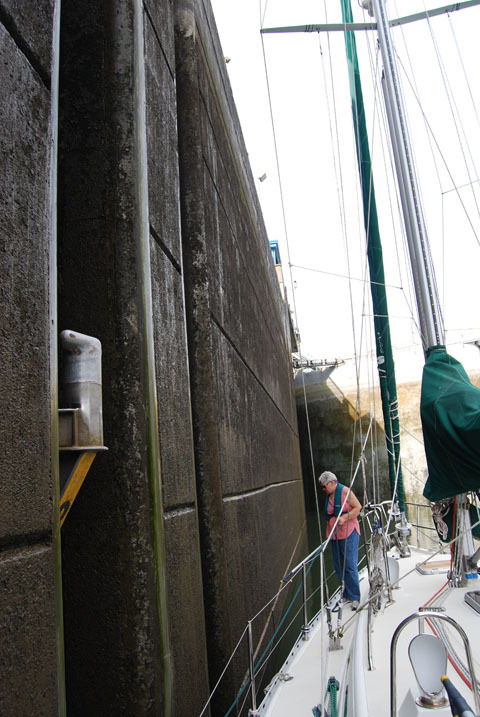 Our experience docking at our slip in St. Helens was the worst of the trip. The current, of course, was still about 2 knots, and it’s quite difficult to keep the boat under control backing into a slip with that amount of current and no wind. In the end, and with considerable difficulty, and help from some non-boater passersby, we managed to make it. Now it’s just a question of cleaning out the refrigerator and freezer, swabbing the decks, and making ready for the next trip. We’re back home, and the weeds have taken over! In between the weeds, we’re finding a lot of good berries, but there’s plenty of gardening ahead. Evidently summer is having a hard time arriving in Western Oregon, and there has been quite a bit of rain while we’ve been gone. The garden has been loving it!